Your premier shop for all things wedding and special occasion! i mean, these ladies do it all folks. Wedding planning, event rentals (think big clear-top tents), floral design. Plus they have a retail shop where couples can do a bridal registry AND anyone can buy a gift for every occasion. We went for a design that was clean, elegant, and timeless. The logo is a great mix of script+sans-serif font that appeals to all ages. And of course photography was HUGE for this project. Patio 44 is a unique, creole style restaurant with multiple locations in South Mississippi. The project was a complete redesign of their existing site. We used clean, modern lines, contrasting colors, & fantastic imagery of the food and venues. The site is crafted responsively so it functions seamlessly across all screen sizes. Customers can quickly view the menu based on location and make reservations right from their device. The Bottling Company is a premier event venue for weddings, parties, and gatherings in Hattiesburg, MS. For this project, we started with beautiful images, an existing elegant logo, and the client's choice of color palette. From there, we designed a clean, modern and beautiful website that functions as a primary source of information and booking requests for this 101 year old, newly-renovated building. Janie Rose Boutique has a 10-year reputation as a one-of-a-kind women's & misses clothing and accessories boutique. The owner wanted a complete site overhaul to provide customers with an easier online shopping experience. First we "updated" the feel of their logo, giving it a touch more modernity but still keeping the recognizable font with elements. We used beautiful photos and color to warm the site up, while purposefully adding the most popular content to the homepage where customers could find it immediately. A solution to sync online sales and inventory with their in-store POS was also integrated. Pam Pegram needed an author website. She is a blogger, speaker, and accessory stylist, and recently published her first book! Pam's website is a mix of informational and eCommerce. The foundation of the site is Pam's blog, Master What Matters, where she writes inspirational content weekly for her growing reader base. The site also includes a short profile, ways to engage with her book material, and a form to contact her for speaking engagements. There is also an eCommerce marketplace where she sells her latest releases, t-shirts and other products. Life Fellowship Church is multi-site church located in North Mississippi. They had recently purchased a 3rd party template, and i worked closely with their team in bringing it to life. We plugged their compelling imagery, modern graphics, and powerful message into the template-based site, and made it an resourceful hub for visitors and members alike. We eventually integrated a CMS so a staff member could make content changes on the fly. Through our ongoing partnership, we regularly update the content and add sub-sites as needed for various events. This is site stays true to the church's core values: relevant, authentic, and fun! Desoto Grace is a local organization actively assisting families in finding resources and opportunities that improve their economic, educational and relational situations. Using a pre-purchased template, we worked diligently to integrate all of their content and imagery in a way that draws community support. It is a hub of information for families, volunteers, and donors that includes descriptions, videos, and ways to get involved or donate. Through an ongoing partnership, we update the website as needed with changing content and events. Southern Creative is pleased to be a "champion" for Desoto Grace in 2017 by donating 5% of profits to their program. Master What Matters began as a blog written by Pam Pegram. Pam wanted a colorful and fun logo, one that included her favorite colors: coral and turquoise. She is a Southern lady and inspired by the beach and sunsets. Since Pam is also an accessory stylist, we chose a beaded necklace in her Premier Jewelry line as inspiration. The Southaven Chamber of Commerce hosts various events throughout its calendar year and needed unique branding for each one. We worked to create clean, two-dimensional brand elements they could use in various online media and print. The Southaven Chamber was very specific with their requirements for a vertical banner and the back of their business cards: picture collage with blurred borders and their new logo. The photos were placed, the logo made to stand out and be seen, and everything spec'd to the proper size and high resolution required for printing. 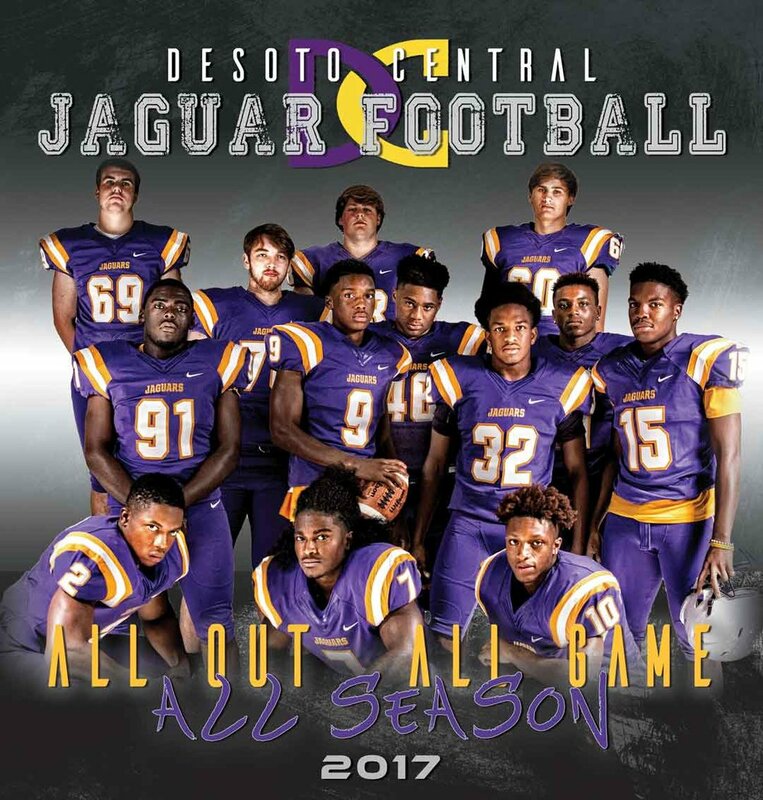 We worked with the local high school football booster club to design their Fall Football program. Featuring business ads, player ads, team schedules, and team rosters & pictures, this group was very proud to share and sell the end product this year. Go Jags!